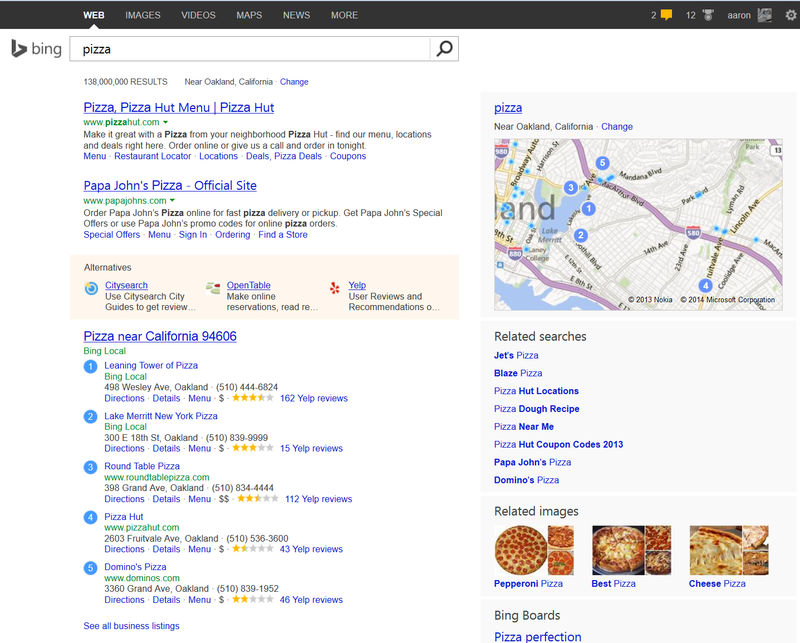 Bing recently stated testing listing 'alternatives' near their local search results. "In effect, competitors will have the 'choice' either to pay Google in order to remain relevant or lose visibility and become irrelevant," a European consumer watchdog, BEUC, said in a letter it sent to all 28 EU commissioners. The letter, seen by The Wall Street Journal, terms the deal "unacceptable." Guest blogging was once considered a widely recommended white hat technique. Today our monopoly-led marketplace arbitrarily decided this is no longer so. Stick a fork in it. Torch it. Etc. Google turns your past client investments into new cost centers & penalties. 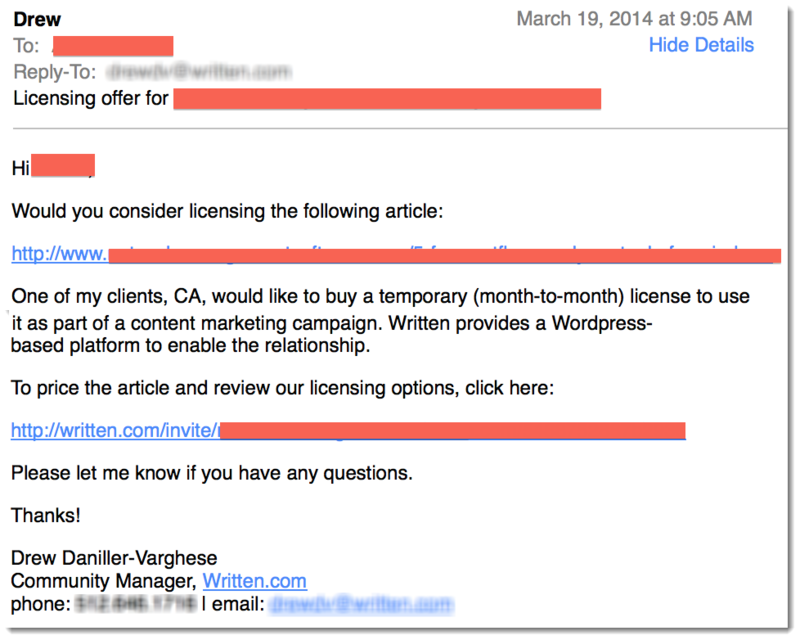 This ought to be a great thing for the SEO industry. Or maybe not. As Google scares & expunges smaller players from participating in the SEO market, larger companies keep chugging along. Curious about their background, he looked up their past coverage: "Written then offers a number of different content licenses that help the advertiser reach this audience, either by re-branding the existing page, moving the content to the advertiser’s website and re-directing traffic there, or just re-publishing the post on the brand’s blog." So that's basically guest blogging at scale. "You give us your gold keywords. Written finds high-performing, gold content with a built-in, engaged audience. Our various license options can bring the audience to you or your brand to the audience through great content." 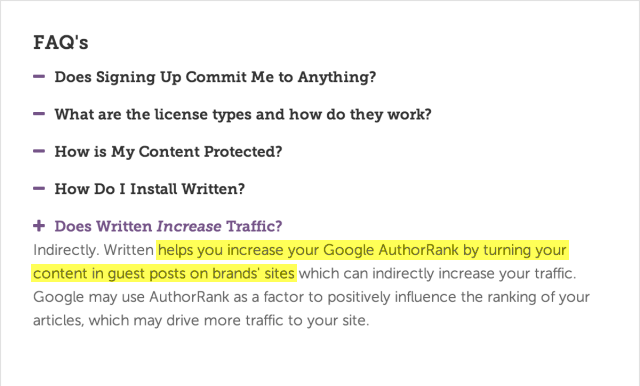 I'm sorry, but taking your most valuable content & turning it into duplicate content by syndicating it onto a fortune 500 website will not increase your traffic. The fortune 500 site will outrank you (especially if visitors/links are 301 redirected to their site!). And when visitors are not redirected, they will still typically outrank you due to their huge domain authority (and the cross-domain rel=canonical tag), leading your content on your site to get filtered out of the search results as duplicate content & your link equity to pass on to the branded advertiser. And if Google were to come down on anyone in the above sort of situation it would likely be the smaller independent bloggers who get hit. This is how SEO works. Smaller independent players innovate & prove the model. Google punishes them for being innovative. As they are punished, a vanilla corporate tweak of the same model rolls out and is white hat. In SEO it's not what you do that matters - it's who your client is. If you're not working for a big brand, you're doing it wrong. If the current war on SEOs by Google wasn’t bad enough if you own the site you work on, then it is doubly so for the SEO working for a client. When the SEO doesn’t have sufficient control over the strategy and technology, it can be difficult to get and maintain rankings. In this post, we'll take a look at the challenges and common objections the SEO faces when working on a client site, particularly a client who is engaging an SEO for the first time. The SEO will need to fit in with developers, designers and managers who may not understand the role of SEOs. Here are common objections you can expect, and some ideas on how to counter them. The objection is that SEO gets in the way. It’s too hard. It’s true. SEO is complicated. It can often compromise design and site architecture. To managers and other web technicians, SEO can look like a dark art. Or possibly a con. There are no fixed rules as there are in, say, coding, and results are unpredictable. So why spend time and money on SEO? Building a website is the equivalent of taking the starting line in a race. Some site owners think that’s all they need do. However, the real race starts after the site is built. Every other competitor has a web site, and they’re already off and running in terms of site awareness. Without SEO, visitors may find a site, but if the site owner is not using the SEO channel, and their competitors are, then their competitors have an advantage in terms of reach. 2. Can’t SEOs Do Their Thing After The Site Is Built? SEO’s can do their thing after the site is built, but it’s more difficult. As a result, it’s likely to be more expensive. Baking SEO into the mix when it is conceived and built is an easier route. Just as copywriters require space to display their copy, SEO's require room to manoeuvre. They’ll likely contribute to information architecture, copy, copy markup and internal linking structures. So start talking about SEO as early as possible, and particularly during information architecture. There are three key areas where SEO needs to integrate with design. One, the requirement that text is machine readable. Search engines "think" mostly in terms of words, so topics and copy need to relate to search terms visitors may use. Secondly, linking architecture and information hierarchies. If pages are buried deep in the site, but deemed important in terms of search, they will likely be elevated in the hierarchy to a position closer to the home page. Thirdly, crawl-ability. A search engine sends out a spider, which grabs the source code of your website, and dumps it back in the search engines database. The spider skips from page to page, following links. If a page doesn't have a crawlable link pointing to it, it will be invisible to search engines. There are various means of making a site easy to crawl, but one straightforward way is to use a site map, linked to from each page on the site. The SEO may also want to ensure the site navigation is crawlable. SEO’s do need to tweak code, however the mark-up is largely inconsequential. SEO's need to specify title tags and some meta tags. These tags need to be unique for each page on the site, as each page is a possible entry page. A search visitor will not necessarily arrive at the home page first. The title tag appears in search results as a clickable link, so serves a valuable marketing function. When search visitors consider which link on a search results page to click, the title tag and snippet will influence their decision. The title tag should, therefore, closely match the content of each page. The second aspect concerns URL's. Ideally, a URL should contain descriptive words, as opposed to numbers and random letters. For example, acme.com/widgets/red-widgets.htm is good, whilst acme.com/w/12345678&tnr.php, less so. The more often the keyword appears, the more likely it will be bolded on a search results page, and is therefore more likely to attract a click. It's also easier for the search engine to determine meaning if a URL is descriptive as opposed to cryptic. SEO Plugins cover the on-site basics. But ranking well involves more than covering the basics. In order to rank well, a page needs to have links from external sites. The higher quality those sites, the more chances your pages have of ranking well. The SEO will look to identify linking possibilities, and point these links to various internal pages on the site. It can be difficult, near impossible, to get high quality links to brochure-style advertising pages. Links tend to be directed at pages that have unique value. So, the type and quality of content has more to do with SEO than the way that content is marked up by a generic plugin. The content must attract links and generate engagement. The visitor needs to see a title on a search result, click through, not click back, and, preferably take some action on that page. That action may be a click deeper into the site, a bookmark, a tweet, or some other measurable form of response. Content that lends itself to this type of interaction includes blog posts, news feeds, and content intended for social network engagement. In this way, SEO-friendly content can be functionally separated from other types of content. Not every page needs to be SEO’d, so SEO can be sectioned off, if necessary. If your aim, or your clients aim, is to attract as much targeted traffic as possible then SEO integration must be taken just as seriously as design, development, copy and other media. SEO is more than a technical exercise, it’s a strategic marketing exercise, much like Public Relations. SEO considerations may influence your choice of CMS. It may influence your strategic approach in terms of what type of information you publish. It may change the way you engage visitors. Whilst SEO can be bolted-on afterwards, this is a costly and less-effective way of doing SEO, much like re-designing a site is costly and less effective than getting it right in the planning stage. 6. Why Have Our Ranking Disappeared? The reality of any marketing endeavour is that it will have a shelf-life. Sometimes, that shelf life is short. Other times, it can run for years. SEO is vulnerable to the changes made by search engines. These changes aren’t advertised in advance, nor are they easily pinned down even after they have occurred. This is why SEO is strategic, just as Public Relations is strategic. The Public Relations campaign you were using a few years ago may not be the same one you use now, and the same goes for SEO. The core of SEO hasn’t changed much. If you produce content visitors find relevant, and that content is linked to, and people engage with that content, then it has a good chance of doing well in search engines. However, the search engines constantly tweak their settings, and when they do, a lot of previous work - especially if that work was at the margins of the algorithms - can come undone. So, ranking should never be taken for granted. The value the SEO brings is that they are across underlying changes in the way the search engines work and can adapt your strategy, and site, to the new changes. Remember, whatever problems you may have with the search engines, the same goes for your competitors. They may have dropped rankings, too. Or they may do so soon. The SEO will try to figure out why the new top ranking sites are ranked well, then adapt your site and strategy so that it matches those criteria. 7. Why Don’t We Just Use PPC Instead? PPC has many advantages. The biggest advantage is that you can get top positioning, and immediate traffic, almost instantly. The downside is, of course, you pay per click. Whilst this might be affordable today, keep in mind that the search engine has a business objective that demands they reward the top bidders who are most relevant. Their auction model forces prices higher and higher, and only those sites with deep pockets will remain in the game. If you don’t have deep pockets, or want to be beholden to the PPC channel, a long term SEO strategy works well in tandem. SEO and PPC complement one another, and lulls and challenges in one channel can be made up for by the other. Also, you can feed the keyword data from PPC to SEO to gain a deeper understanding of search visitor behaviour. 8. Does SEO Provide Value For Money? This is the reason for undertaking any marketing strategy. An SEO should be able to demonstrate value. One way is to measure the visits from search engines before the SEO strategy starts, and see if these increase significantly post implementation. The value of each search click changes depending on your business case, but can be approximated using the PPC bid prices. Keep in mind the visits from an SEO campaign may be maintained, and increased, over considerable time, thus driving down their cost relative to PPC and other channels. 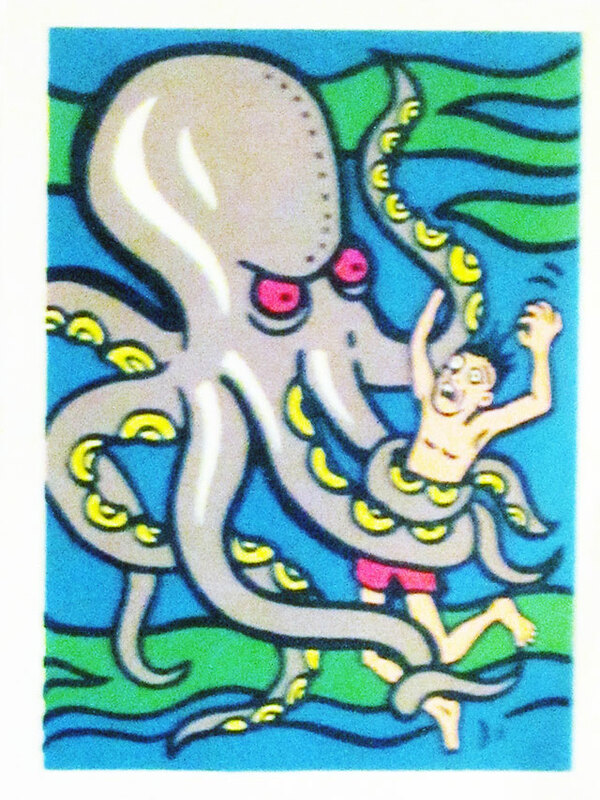 Action is taken when a user anticipates a reward. An example might be clicking on a link for a free copy of a book. There are two conditions needed for a reward to work. It must be easy and there must be a strong motivation. The investment required - the click and attention - is typically a lower “cost” than the reward - the book. On social sites, like Facebook, the reward of the “like” click is the presumption of a social reward. For one off sales, there aren't opportunities for habit formation in the same way as there might be for, say, Facebook. Habits can be a defensive strategy. 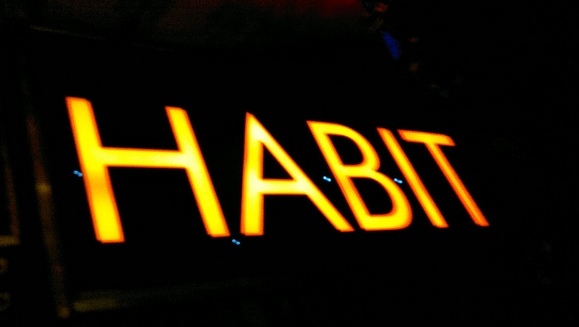 It’s hard for a user to leave a company around which they've formed a habit. On the surface, there is a low switching cost between Google and, say, Bing, but how many people really do switch? Google has locked-in users habit by layering on services such as Gmail, or just the simple act of having people used to its interfaces. The habit of users increases their switching cost. Changing user habits is very difficult. Even Google couldn't do it with Google Video vs the established YouTube. If you’re thinking of getting into an established market, think about how you’re going to break existing habits. A few new features probably isn't enough. If breaking established habits seems too difficult, you may decide to pick an entirely new niche and try to get users forming a habit around your offering before other early movers show up. The most obvious thing is that Jobs wanted his products to be simple above all else. But Jobs realized early on that for them to be simple and easy to use, they had to be based on things that people already understood. (Design geeks have since given this idea a clunky name: so-called skeuomorphic user interfaces.) What was true of the first Macintosh graphical interface is true of the iPhone and iPad--the range of physical metaphors, and, eventually, the physical gestures that control them, map directly with what we already do in the real world. That’s the true key to creating an intuitive interface, and Jobs realized it before computers could really even render the real world with much fidelity at all. [An example of "imputing" Apples values on the smallest decisions: Jobs spent hours honing the window borders of the first Macintosh GUI. When his designers complained, he pointed out that users would look at those details for hours, so they had to be good. Look for ways to reward the user when they take action. Forums use social rewards, such as reputation and status titles. Facebook has “Like” Buttons. Inherent is this reward system is the thrill of pursuit. When a visitor purchases from you, or signs up for a newsletter, do you make the visitor feel like they've “won”? Checking habits may change in the near future as more and more informational "rewards" are added to smartphones. The paper argues that novel informational rewards can lead to habitual behaviors if they are very quickly accessible. In a field experiment, when the phone's contact book application was augmented with real-time information about contacts' whereabouts and doings, users started regularly checking the application. The researchers also observed that habit-formation for one application may increase habit-formation for related applications.